As I write this, the sun is shining and the snow is melting. Earlier this morning, the birds were singing a very happy tune. I can finally see sections of our lawn that for months lay hidden under piles of snow. The trees and shrubs are still bare but it won’t be long before buds will appear and the yard will transform from its dreary brown to a lush green. Our street is three miles long and has many beautiful stone walls. And yet, there is one wall in particular that has been consistently the first to announce the arrival of Spring. 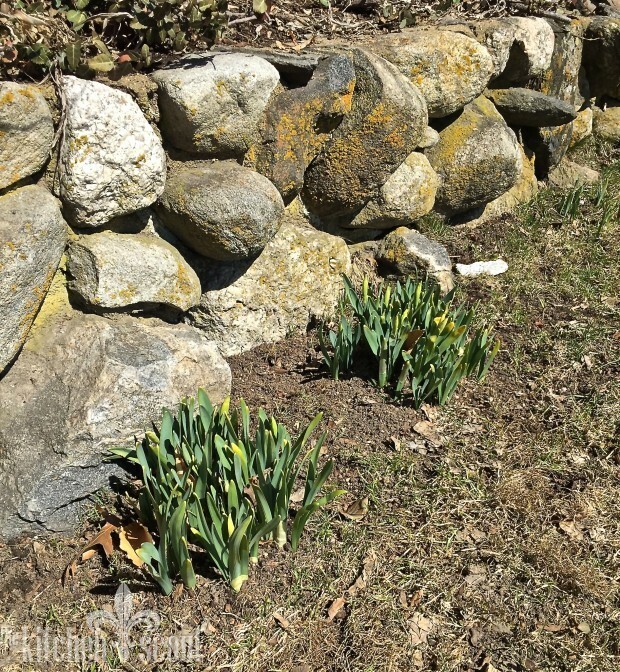 Crocuses and daffodils line the grass in front of this wall and it is always exciting to see these annuals emerge from the ground year after year like clockwork. For me, they represent rebirth, renewal and hope, similar to the Easter holiday many will be celebrating this weekend. I slowed down on my way by that wall today. Spring’s welcome wagon was out in full force so I snapped a picture! This weekend, I am looking forward to spending Easter with our family and some friends in Rhode Island. I am planning to make my mother’s recipe for Carrot and Pineapple cake to share. The recipe is old school, complete with a can of crushed pineapple and a simple lemon glaze. Similar recipes are all over the internet and Pinterest. 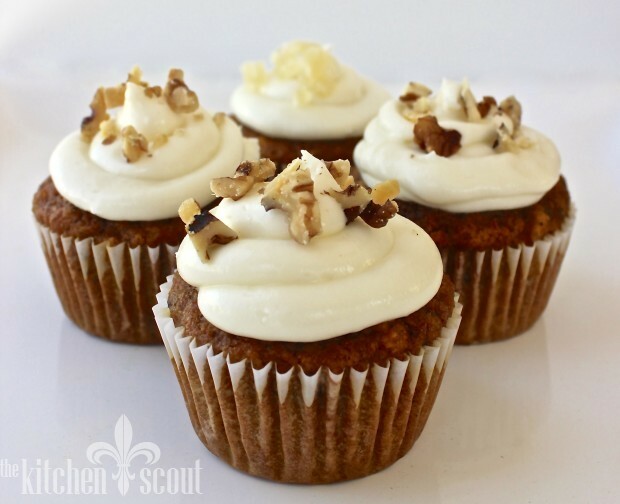 I happen to love carrot cake, but I don’t always have the time or occasion to make it. 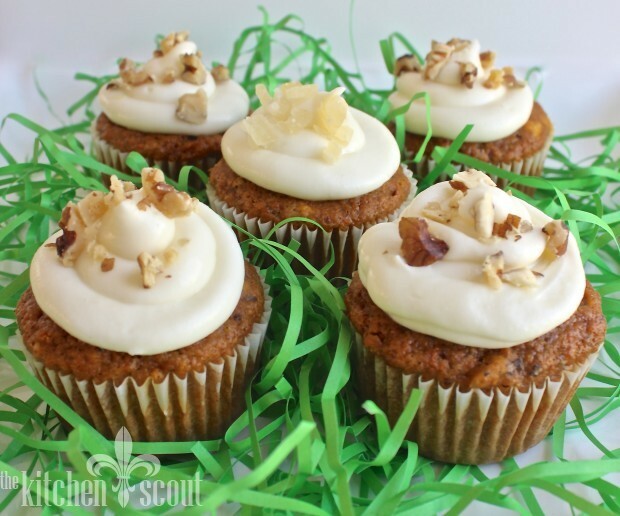 That’s where these Carrot Cake Cupcakes come in very handy. I have made these little morsels with great success a number of times and thought now was the perfect time to share them with you. Without frosting (or with, I am not judging) they can be a wonderful addition to your Easter breakfast or brunch. 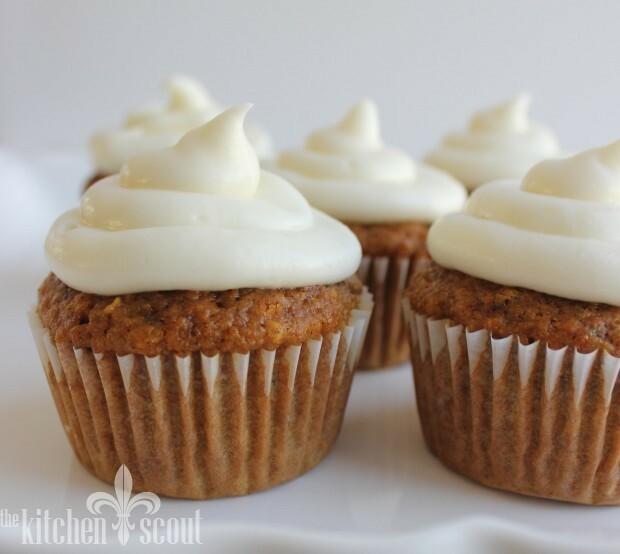 With the frosting, they are a perfect little confection to add to your dessert table. 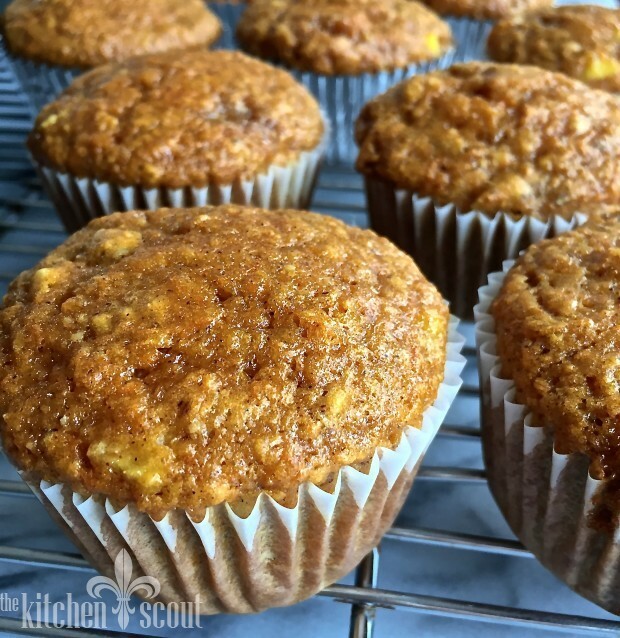 The recipe comes from Ellie Krieger and uses whole wheat pastry flour and applesauce which results in a slightly nutty, moist and tender cupcake. I have adjusted her recipe to incorporate my mother’s pineapple and to make the frosting slightly more decadent for the holidays. 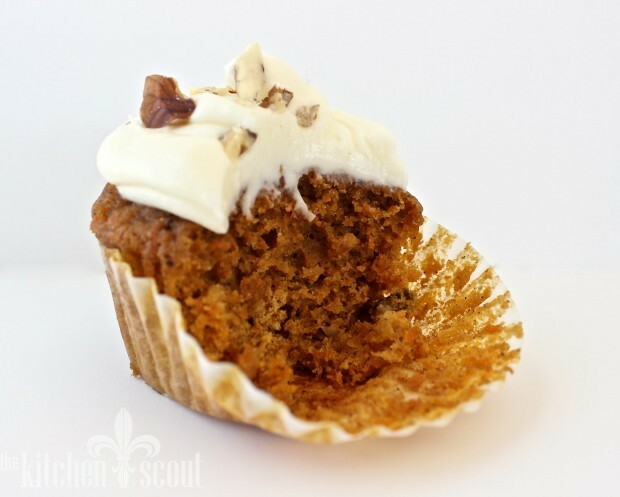 They have a very similar flavor to most of the carrot cakes you’ve eaten and are a lot easier to make! Whatever you are celebrating this weekend, even if it’s just the arrival of Spring, I hope you whip up a batch of these for your loved ones. Have a wonderful weekend and be on the lookout for those crocuses and daffodils! In a medium bowl, sift together both flours, the baking soda, salt and spices. In a large bowl, whisk together the oil, brown sugar and eggs until well combined. Whisk in the applesauce, vanilla and carrots. Add the dry ingredients and mix until just combined. Stir in the pineapple, if using, and the walnuts. Divide the batter between the muffin cups. Bake until a toothpick inserted in a cupcake comes out clean, about 20 minutes. Transfer to a wire rack to cool completely. in the bowl of an electric mixer fitted with the whisk attachment, blend together the cream cheese, confectioners' sugar and the lemon juice until smooth and creamy. Frost the cooled cupcakes and sprinkle with either the walnuts or candied pineapple. Cupcakes should be stored in the refrigerator where they will keep for about 3 days. Val, you shared this cupcake recipe with me a few years back and I have been them ever since. I love the addition of “your mother’s” pineapple. Happy Easter to you and your family. Thank you, Francine! I am going to actually try to swap out part of the oil with applesauce in my mother’s cake recipe and see if that works as well. Happy Passover to you and your family! Val they are so pretty! Awesome pictures too. Its hard to believe that flowers are growing somewhere in our vicinity. Is that an April Fool’s joke? Happy Easter to you. Thanks, Ellen! And no joke – I was so surprised when I drove by (across from Hutchins) and saw them all peeking out! Such a hopeful sign that the good weather will be here to stay sometime soon!